Saint Georges sur Loire, Pays de la Loire, France. When somewhere possesses rooms with names such as Relais de Chasse, Pavillon of the Reine, and Refuge d'Aphrodite, one can be certain that this is a place that eschews all notions of sterile corporate hospitality. And so it is with Chateau de l'Epinay; a fabulous fortified country house whose origins can be traced back as far as the 13th century. It should be noted that most of the present structure dates from the 16th and 18th centuries, but there's no doubting the deep historic importance of the estate. However, for the purposes of connecting it to a recognisable name from the past, the place claims some connection with the playwright Jean Racine. 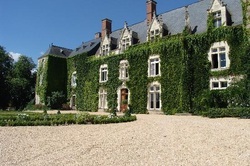 Angers is just a short drive away to the east, while Nantes is also within easy reach by car.